"There's cartoons are on channel 5?" Aliza says incredulously, this morning. "Yep. You know when I was a kid, there was no Disney Channel, no Nick Jr., no Cartoon Network. 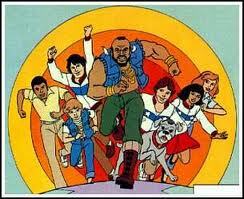 We could only watch cartoons on the regular channels on Saturday mornings. And sometimes Sunday mornings. We'd all get up early to watch cartoons on Saturday mornings because that's the only time they were on." I told her.